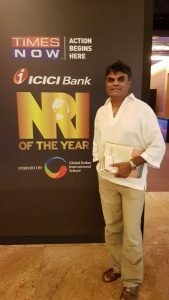 I am delighted to announce that THE TIMES OF INDIA Group has conferred the NRI (Non Resident Indian) OF THE YEAR Award 2018 for Philanthropy to me. “The Award celebrates the success of remarkable Indians”. Held annually, the NRI of the Year Awards – India’s only distinctive awards for Global Indians, recognises and honours exceptional achievements of Indians who leave the comforts of home for unknown challenges across the globe, going beyond the ordinary to make a huge difference. The Times of India Group has a reach over 100 + countries, across 5 continents, reaching over 3 million Diaspora. Hersha and I attended the award ceremony on July 11th 2018 at Grand Hyatt Mumbai. What the TIMES OF INDIA says….. These heroes are the ones who have made their mark on foreign shores, sheared of the cocoon of one’s Motherland. These Business Leaders, Scientists, Doctors and Philanthropists, are heroes of the contemporary world. They have overcome hurdles, inspired and awed people native of the land they now reside in. 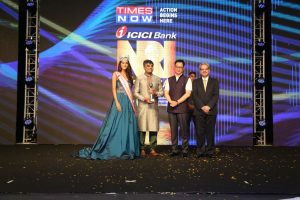 With nearly 30 million Indians now living across the world, the NRI of the Year Awards are a testimony to the significant contribution of the Indian Expats, to the immense success of their host nation. The awards are conceptualised as a platform to recognise and accolade these unsung heroes who make all Indians proud and inspire millions back home to further hone their skills and chase their dreams. The design of the trophy of NRI of the Year Award is inspired from the legend of Hercules, the one who shouldered Mount Atlas, in sync with the attitude of the winner, shouldering a huge burden in pursuit of excellence. The trophy’s golden colour is symbolic of success, achievement and triumph. The awards are given to those who have demonstrated outstanding commitment to the wider community through various means such as, support of charitable programs, engineering & leading public awareness campaigns, empowering minorities, supporting the most vulnerable in society and through demonstrating leadership in philanthropy. I am humbled and honoured to receive this award. My deepest thanks go to The Times of India Group and to the esteemed Panel of Judges who selected me. I share this award with all those who have been on in this remarkable journey with me. My family, my wife Hersha, my wonderful Board of Trustees, who over many years have given me their wisdom, support and generosity. Also the Foundation’s army of dedicated supporters and to our major sponsor, The First Recruitment Group. Finally, I thank the generous donors who give so kindly of their time, talent and monies. Together our life changing work is inspiring many to get involved and secure our legacy of making a huge difference to the lives of the poorest in India.